Pictured, from left, are, Vice President of Professional Services, Todd Howell; Chief Executive Officer, W. Scott Burnette; Phlebotomist, Yolanda Talley, Director of Laboratory Services, Christina Duke. The February VCU Health Community Memorial Hospital team member of the month is living proof. 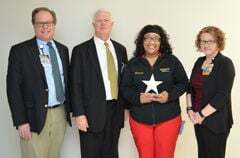 Yolanda Talley, a phlebotomist with the CMH Lab, has earned repeated high praise from patients and staff she interacts with, according to Christina Duke, manager of the lab. One such compliment earned Talley the first-ever team member of the month award for a lab employee. Talley has been with CMH for the past four and half years and works throughout CMH collecting blood samples from patients. Talley works with patients in the emergency department, ICU, PACU, Acute Care, and in the Hundley Center. Talley is a giver. During her off time from work, she is the jayvee girls basketball coach at Park View High School, an assistant coach to the varsity team and an assistant track coach for the Dragons in the spring. Talley has two children, Nyjay, her high school age daughter, and Elijan, a fourth grade. In her spare time from work, coaching and parenting, Yolanda is a movie junkie. Other team members nominated in February were: Adelyn Beiler and Caitlin Crowder from Acute Care; Sean DeVaughn from Environmental Services; Amy Lynch from Care Management; Megan Mull from the Emergency Department; Joyce Paynter from Lab; and John Watson from Physical Therapy. In addition to the award certificate, Talley received a STAR Service lapel pin, letter of commendation from Administration, a $40 gift certificate, and a parking place of her choice for the month.